This concept was created so as to address rising sea levels and shrinking water stocks and, it has been developed by Alex Romane [PA founder] in consultation with Trevor Baylis [TV presenter and inventor of clockwork electricals]. Proposed initially as a solution to deal simultaneously with the world's rising sea levels and the world's diminishing drinking water stocks, other benefits that would come from developing this idea include a massive increase in employment [and therefore a potential expansion of the UK economy], less potential for climate-change refugee migration and less potential for the threat of future global land and water wars. Salt stocks [acquired during a desalination process] could be used to reduce any country's salt imports whilst enabling that country to instead become an exporter of salt - again, contributing to that country's economy. The idea is simply based upon building a 'plug hole' into the world's oceans so that we can 'let water out' in a controlled and directed way. The water we let out is collected and purified in a salt-separation process and then delivered into the current mains water supply system. Put simply - opening a plug hole in the world's oceans as and when we choose, would allow us to control the rate of rising sea levels and to desalinate, collect and distribute sea water as drinking water. All of the components of this system are currently in use around the world separately. Bringing them to work together to form a Sea Water Intake and Processing Plant could be a step in providing a solution. Where possible, energy from nature [solar and sea pressure] will be used in the process so as to keep costs as low as possible and to reduce any environmental impacts that may be produced from the process. At one end, the plant takes in sea water and separates and purifies it. At the other end the purified water is collected in underground reservoirs ready for delivery into the existing system. Scientists and Civil Engineers are now suggesting that we move our existing drinking water reservoirs underground as this will slow down the evaporation process and retain more of the water, so this part of the process is going to happen anyway. Doing it as part of this idea reduces the overall cost as these new underground reservoirs could be used in the process instead of additional ones being built. 1. Water pressure and gravity force sea water into and through the water in-take pipe. 2. Pressurised water drives multiple turbines so as to generate electricity [used with solar and conventional electricity in the separation process]. 3. Gravity and water pressure is used to deliver the sea water to the on-shore separation plant. 4. Separation plant boils water, evaporation process enables separation of salt from water and purification. 5. Water is retained in underground reservoirs and delivered by tanker into the existing system. 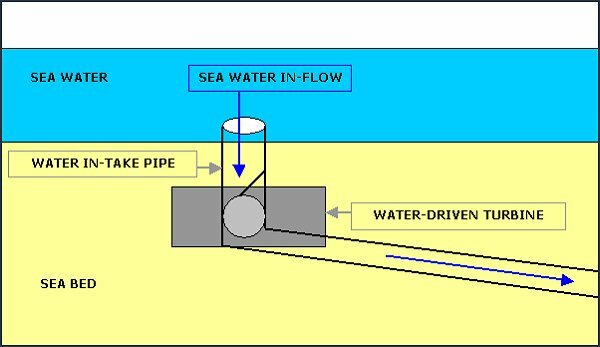 Sea water inflow/outflow balance is controlled by valves so that there is never more water coming in than is going out. Sea water is boiled in chambers, the evaporated droplets purified and collected to become drinking water stocks - salt stocks remains in the chambers. Underground reservoirs collect and retain the purified sea water whilst protecting it from evaporation. Tanker pick-up and delivery achieve distribution of water into the existing network. This also eliminates the need for pumps to have to bring the water above sea level as the tankers will drive underground. In some parts of the world, it could be more viable to build sea-based dams instead of using the intake system but either way, both systems would deliver sea water on-shore ready for desalination, storage and distribution. Should the People's Administration install direct democracy, we propose to put the above design to UK engineering and scientific institutes for further assessment and development.